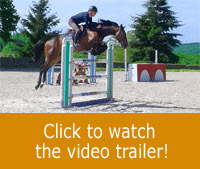 The goal of this session is to obtain a constant rhythm when approaching and landing fences. For this session, Michel rides ZZ Top and Veronique, Bjorn, a 6 year old horse. The session starts with some exercises on cavalettis, and a small succession of fences that will enable Veronique to test her ability to control the cadence. As for Michel, he rides ZZ Top, which allows him to show the actions to be taken and the attitude to adopt in order to reach the desired result. Veronique has also to be aware of her mind-frame and to set some definite goals to observe no matter what happens. Here, the priority is to control the speed before and after the fence no matter the place of the take-off stride. Michel offers Veronique some solutions that enable her to maintain the correct position and to not bother Bjorn when difficulties arise. The session continues with a course that Michel also jumps with ZZ Top. Veronique must keep in mind her set-goal even when difficulties arise faster. The course proves to be really educative as it makes the riders work on some shorter distances towards the end.At the end, Veronique succeeds in reaching her goal staying really mentally present throughout the course. 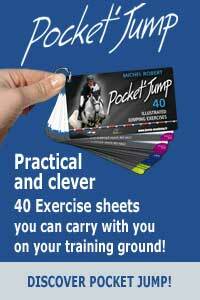 - To control the horse’s speed doesn’t mean to slow down on the approaches. We can control the horse even at strong rhythm. - In order to progress, you need to stay “engaged” and to give yourself some goals you’ll observe no matter what. - When the distance of take-off stride is not optimal, the rider must be malleable in order to allow his horse the freedom of movement.